Emerald is the most beautiful shade of green, the quintessential jewel tone. It’s synonymous with luxury and style and looks chic on women at any age. Wear it with neutrals or give your outfit a bold accent color with emerald accessories. Right now Ann Taylor is featuring Emerald in their spring collection. They have a lot of beautiful pieces I ran across that work really well to transition you from cooler weather into spring. Here’s a look at some of my favorites. This pretty pleated skirt is a total head-turner! Ladylike knife pleats in floaty fabric contrasted with chic cropped trench jacket give this outfit a cool, sophisticated vibe. Standout stripes in Emerald green always look chic with black pants, especially when you a blouse that has as gorgeous a neckline as this one! Pair your favorite jeans with a floral Emerald green top that’s easy and breezy. This short V- neck flutter sleeve top would look also look fabulous worn with a cute jacket. Everyone loves a sweaterdress because they are so relaxed and comfy and this one is very pretty too. The scalloped trim hem and sleeves make this lovely emerald dress very on trend and feminine too. This is the type of dress you can dress up or down with jewelry, a jacket, a scarf or whatever depending on if you want to wear it to work or just out for dinner on the weekend. Wear it your way! If too much of a good thing makes you feel like you’re in “The Land of OZ”, you can still get the Emerald glow by adding a pretty Emerald print scarf to a basic white sweater or tee. This stunning scarf adds tons of class and a very rich feel. 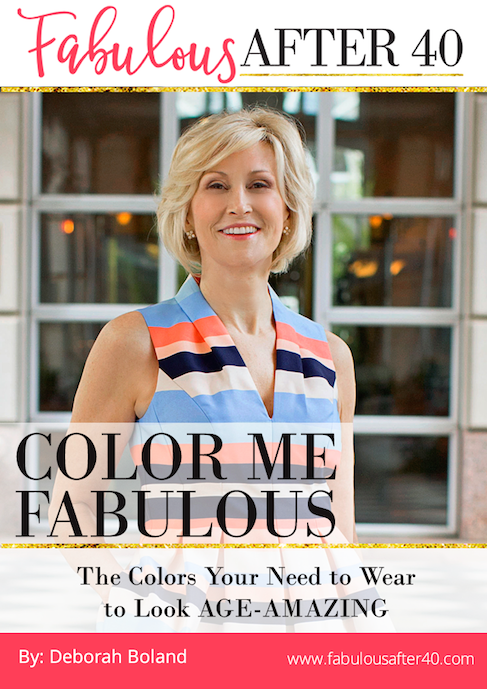 Please don’t forget to check out my Ebook, Color Me Fabulous: The Colors You Need to Wear to Look Age-Amazing™. This is a terrific guide to the colors that will make you look vibrant and beautiful, slim and classy at 40, 50 and beyond. 1 comments on "Emerald Green Sparkles this Spring"